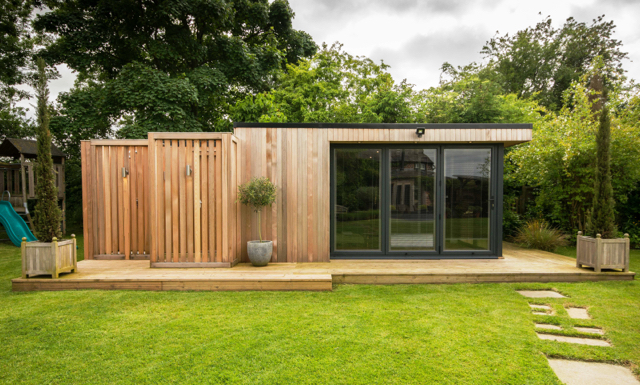 Swift Garden Rooms were recently asked by one of their former customers if they would return and add a sauna to their contemporary garden room buildings. The Swift team were really excited by the project and looked into the options and design requirements of building a sauna. The Swift team carefully designed the new extension so that it blends with the existing garden room. The sauna extension needed to be specially insulated and the doors were clad to match the rest of the building. The structural integrity was maintained by a slightly dropped EPDM covered roof. The existing decking was extended and exterior lighting added. The new extension features a cold water shower and slatted cedar panels for privacy. As you can see from the photos this is a luxury addition to this already striking garden room.